Our Primary Training Materials…Get the Most Out of AssessME.org! We believe that “equipping people for the works of service” is one of the church’s top mission mandates (Eph. 4:11 & 12). For this reason, David authored Made for a Mission, and eShift, to serve as our primary equipping tools. Made for a Mission is our AssessME.org training resource for church pastors, staff. To that end, this book helps church staff to mobilize volunteers and build effective teams. Note, Made for a Mission is a deep-dive into how to use our assessment data within your church. eShift is a cultural analysis of the declining television-influenced church. 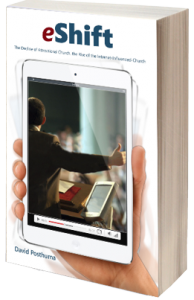 The television-influenced church makes up approximately 90% of today’s churches. However, there is presently a rise of the internet-influenced church. These few churches understand that a significant culture-shift is occurring. This new culture has unique values that will radically impact how we “do” church in the decades to come. THE ESSENTIAL TRAINING TOOL FOR MINISTRY LEADERS who use AssessME.org. 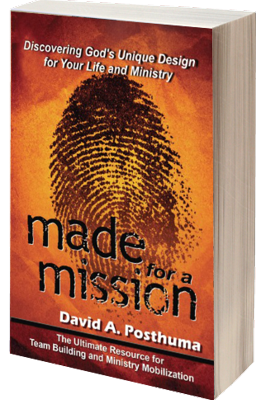 Made for a Mission by David A Posthuma, published by CLC Publications, is the essential training tool for ministry leaders using the spiritual gifts, personality, and leadership style assessments offered by AssessME.org. David A. Posthuma authored Made for a Mission to be the primary training tool for pastors and church staff using AssessME.org within their church. Written from a pastoral perspective. Made for a Mission will help your team get the most out of our volunteer-mobilization assessment tools. What Leaders Are Saying About Made for a Mission…. Dennis Moore: “What intrigued me most was how one could use the assessments you provide to help someone identify their life mission, form teams, and provide mentoring for ministry mobilization… I found your book intriguing and probably the most useful tool I’ve ever been exposed to.” (Dennis Moore, Trinity Church, Lansing, MI). Dan Webster: “David Posthuma shares my passion to train and inspire leaders to live authentic lives of great impact…pay attention to what he is doing and access his outrageous resource. It will help you as you both grow and organize your church” (Dan Webster, Authentic Leadership, Willow Creek, & Crystal Cathedral). OW WE “DO” CHURCH…PREPARE FOR CHANGE. Christ’s church should remain doctrinally sound. Yet, it should also be reforming its methods so that it may communicate the Gospel to an ever-changing culture. This is what eShift: The Decline of “Attractional” Church and the Rise of the Internet-Influenced Church is about. This book introduces the differing values between the television-influenced culture…which has dominated church since the ’70s…and the internet-influenced culture. The differences between these two cultural value-sets are quite profound. What Leaders Are Saying About eShift…. Extremely pertinent in our times of paradigm communication shift! “Can be extremely useful in informing the church’s transition to effectively impacting recent generations with a positive, relevant and biblical portrayal of the gospel message”. Dan Webster: “The church has been choking for decades on the naive assumption that the world hasn’t changed. eShift provides the necessary Heimlich Maneuver to clear her throat so that the fresh air of life and relevance can return. If you are over 40 this writing will be a wake-up call. If you are under 25 you will shout Hallelujah that someone has finally stated things as they truly are. Either way, eShift is a gift to the church. Let’s hope it’s one that is opened and applied, not ignored.” (Dan Webster – Authentic Leadership Inc., Willow Creek, Crystal Cathedral). Leonard Sweet: “I expect this book to stir controversy, but of the best sort: Eye-opening and mind-altering perspectives on what it might mean for the church to embrace the internet today as the primary delivery system for learning and faith development as our Protestant ancestors adopted the book as their primary delivery system in the Reformation Church.” (Leonard Sweet, best-selling author and professor, Drew University, George Fox University, and chief contributor to sermons.com). Quentin Schultze: “eShift challenges us how to think about and practice ministry in the age of digital networking, social media, multimedia technologies, and mobile devices. No one knows exactly where this techno-cultural epoch is heading, but Posthuma invites us to participate in the conversations that will undoubtedly shape how we respond to emerging opportunities.” (Quentin Schultze, Arthur H. DeKruyter Chair, Professor at Calvin College).